1. Great Food: Conde Nast Traveler ranked Naples number 20 as one of the America’s Best Food Cities, surpassing Miami. Millennials under age 35 made up nearly 7 out of 10 of the high-net-worth individuals looking for a new home in the million-plus range, while Gen-Xers (those ages 35-49) comprised half. The others that are near retirement made up 17%. And for other price ranges, the demographics are changing. 3. Jobs: With an explosive job growth due to jobs in construction, retail and healthcare, Naples Florida is the Top (#1) area in the country for the fastest rate (4.6%) forecasted to continue through 2017. Many new residents will fuel the job pool as well as be the recipients of the multitude of goods and services available to all demographic groups. 4. Naples Residents are Happy! : In fact, they rank as the fourth-happiest city in the U.S. No other Florida town made the Top Ten list of the happiest places to live. 5. 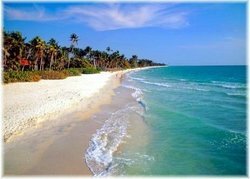 Unmatched Beaches: Two of the Best Sugar Sand Beaches in Florida: Delnor-Wiggins State Park was ranked no. 1 by tripping.com, with 199 acres and many activities including kayak rentals. The water is clear and a paradise for fishing, birdwatching, swimming, and more. Clam Pass County Park was rated #3 with 35 acres of sprawling mangroves and pristine beach, just steps from the Naples Grande Hotel. There are a variety of home styles and price ranges to choose from, and many homeowners start out part time until they are ready to relocate. So, how do you find your dream home? Let me show you how to be happy!